When you are looking for a dog to add to your family, you can’t go wrong with a Lab or a Golden. Both breeds are loyal family dogs that get along well with children, and both are easygoing. How do you decide which breed to get? In this article I will help you make the decision easier, while there are many similarities between these dogs, there are also some key differences. Labrador Retriever vs Golden Retriever, which one will you choose? The Labrador and the Golden are both Retrievers, meaning they were bred for hunting. Retrievers were originally bred and trained to be gun dogs, they would collect shot game and bring it back to the hunter without damage. Retrievers are known for their soft mouths, meaning they can carry game in their mouth without biting into it and causing damage. The word retriever means someone who gets or brings something back. Both a Lab and a Golden will play fetch with you for an endless amount of time, and they can often be seen carrying a stick in their mouth. Retrievers always have to be carrying something in their mouth, whether it is a tennis ball, a rock, a stick, a sock, or a glove, they will pick up and carry whatever they can find. Probably one of the main differences between the Labrador Retriever and the Golden Retriever is their coat, the length of it and the color. You certainly can’t mistake a Black Lab for a Golden Retriever, but when looking at a Golden Lab and a Golden Retriever, they look quite similar with subtle differences. A Labrador has a short coat, and a Golden has a long flowing coat. The bad news is that both of these breeds shed, some people think that because a Lab has a shorter coat it will not shed, or not as much as a Golden sheds. This is not true, a Lab will shed just as much, if not more. The shorter coat on a Lab means less maintenance than a Golden’s coat. The long coat on a Golden needs regular trimming of the feathering, to keep it looking neat and free from tangles and mats. Both breeds have a double-coat, meaning their coat consists of a top-coat, and an undercoat. The top-coat protects the dog from dirt and debris, and the undercoat keeps them warm in the winter and cool in the summer. The undercoat is what sheds heavily twice a year (Spring and Fall), and moderately throughout the rest of the year. The coat of a Lab is short and feels coarse to the touch, whereas the coat of a Golden is soft and fluffy feeling. When owning either of these dogs, you will have to put up with their shedding. Both breeds need to be brushed regularly, but brushing a Golden will need to be done more often, if not daily to keep the coat from tangling and looking ragged. Brushing regularly will help minimize some of the hair in your home. The color of the coat is different too. The Labrador Retriever comes in black, chocolate, and yellow, and the Golden Retriever ranges in shade from light golden (almost white), to a dark golden (almost red). Both a Lab and a Golden are similar in size, they are considered a medium to large sized dog. They share a height of about 22-24 inches, and their weight is roughly the same. Golden Retrievers weigh 55-75lbs, and Labs weigh 65-80lbs. Females of both breeds will weigh less than their male counterparts. Labs are generally slightly larger than Goldens, and have a more solid and sturdy frame. They are more muscular. Both of these breeds have floppy ears, long tails, happy enthusiastic expressions, and webbed feet. Golden Retrievers have a longer snout, and Labs have a broad head, and a medium non-tapered muzzle. Both breeds are friendly, active and outgoing. They each make great family pets, and get along with other animals. Both breeds are friendly to strangers and everyone they meet, this makes them terrible at being guard dogs. They do make good watch dogs however, barking at strangers coming to your door. Labs and Goldens are both highly intelligent, and are used as working dogs. They make great bomb sniffing dogs as they have a great sense of smell, and they are often used as therapy and assistance dogs. Both of these breeds are extremely popular, and are often seen in television and film. A Golden Retriever has a more calm demeanor than that of a Lab, and Goldens have a stronger need to be around humans all the time. I would say that a Golden Retriever is more sensitive, meaning that you cannot get angry at them or use a harsh tone of voice when they have done something wrong, their feelings will get hurt. A Lab however, is not that sensitive and when scolded can easily brush it off. Both breeds do well in families with children, but a Labrador will be able to adapt easier to a household of young boisterous and loud kids. Golden Retrievers prefer a more calm home environment. The Lab is a more high energy dog than the Golden, and all of that energy can be focused on chewing and being destructive, if they are left alone for long periods of time, or they become bored. A Golden Retriever has a medium energy level, and is comfortable with the daily flow of the household. Daily walks, and play time are a must for both breeds, but a Golden will be happy to take a nap in between. Labradors are more independent than Golden Retrievers, they both enjoy being around their owners, but a Golden will be a little more clingy. It is important to remember that the temperament of both breeds is a generalization of the breed, and every dog is different and has their own personality. Both a Lab and a Golden are highly intelligent, they want to please their owners, and they are quick to learn new things. Training a Golden is likely more of a joy because they are eager for praise and affection. Golden Retrievers are patient and attentive, and their calm demeanor makes them easy to train. A Labs high energy level will mean they might lose focus and concentration on the training. Both breeds are considered easy to train, and will do anything for a treat. There are certain health problems associated with each of these purebred dog breeds. They both share similar health problems, and then they each have breed specific health problems. Entropion: a genetic condition that causes a portion of the eyelid to be inverted or folded inward. The lifespan of both of these breeds is on average at 10 to 12 years. Golden Retrievers and Labs are generally quiet dogs, and bark very little. They are not the type of breed that barks a lot and at everything. They will bark at strange noises, when alarmed, and when a stranger comes to your door, or for food, but other than that they are quiet. Both breeds are known for their friendly and outgoing personality, and they want to be friends with everyone they meet, including strangers. They may bark at a stranger, but once that stranger approaches them their tail will wag and they will expect to be petted. The bark of these breeds is a friendly bark, not aggressive. While these breeds are quiet, obsessive barking can become an issue if they are left alone for a long period, or if they become bored. I often hear from Lab owners that their dog eats anything and everything, and that it is a “Lab Thing”. Well, let me tell you I own a Golden Retriever and this has become one of my problems too. It is not just a “Lab Thing”. Both breeds are motivated by food, and will give their owner that “sad puppy dog look”, wanting food while you are eating. Owners of these breeds know that food motivated dogs are easily trained by treats, and the trick to getting their dog to behave or do what they want is by giving them a treat. 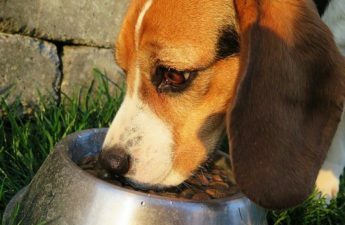 All the treats add up, and as an owner of these types of dogs you really need to watch their food intake. Both breeds are prone to obesity, so it is very important not to overfeed, and to keep your dog at an ideal weight, to improve their quality of life. While the Labrador and the Golden do share a lot of similarities, there are a few key differences between them. Both require an active lifestyle, and are happy to go swimming and play fetch with you. If you are looking for a more energetic dog, then a Lab might be your choice, a Golden is active as well, but might prefer a calmer environment. Some people might have a tough time deciding between these two breeds, and others are either a Lab person or a Golden person. Regardless which breed you choose, you will end up with a friendly, outgoing and loving member of the family. What about you? Do you own either of these breeds, or are you trying to decide between them? I would love to hear from you, please leave a comment below. Hi Melody, thanks for commenting. I’m happy to hear that you would choose a Golden Retriever, when the time comes. They are wonderful dogs. I loved all the pictures of dogs in this post. Golden retrievers and labrador retrievers are some of the nicest dogs. I didn’t realize that there was a difference between them until I read this post. I think if I were to get a lab, I’d get a black lab. Just a personal preference. Hi Melinda, there are so many similarities between these breeds, that many people see these dogs as the same. It is sometimes hard to know the differences, especially between a golden lab and a golden retriever. It is great that you know the type of dog you want, black labs are beautiful. Hello Jenny that was a good post. I am currently looking to buy a dog now. Which one of them will you recommend for me? Thanks in advance. Hi Kuu, when looking for a dog you need to examine your lifestyle, and your personal preference. Both of these breeds require an active lifestyle, and they cannot be left alone for a long period of time. If you have the time to give, and are able to provide them with plenty of exercise, then you can’t go wrong with either. I wanted to get my brother a dog and it seems like a Golden Retriever is a better option for him as they like to be around humans more. I am sure my bro will like that. Both breeds crave human interaction and affection, but yes a Golden is more needy of it, they are more “people dogs”. I love your post. We have had both. Excellent dogs and family members. Though my wife became allergic to the hair and we finally had to say good by because of the health reason, have missed them. I am so glad you made this post. Keep it up for all to see. Hi Ronald, thank you for your comment. You were lucky to have owned both of these breeds, they really are great. I am sorry to hear that your wife developed allergies, and you had to say goodbye to them. I am glad that you enjoyed my post. I learned a lot about the difference between goldens and labs in this post! I have never had a golden, but we did have a yellow lab we lost to cancer last year. 🙁 We miss him every day. We currently have a corgi and she is happy being an only dog (she had jealousy and some anxiety when we had her and the lab), so I don’t know that we will get another lab anytime soon, but we miss having such an easy going dog for the kids, that’s for sure! Holly, sorry to hear of the loss of your Lab. Dogs really do become a part of your family, and losing them is the hardest thing. Really learned a lot from your article. I didn’t know that a Labradors’ “full name” is Labrador. I was a bit surprised that the Golden Retriever favours a calm environment, as I perceived him as no.1 family dog (with little children). I’m always a little concerned with those pure breed dogs as the are prone to many diseases – you listed some. Nevertheless, great dogs and great comparison. Felix, thank you for commenting. It is always a concern when getting a purebred dog, the health issues that go along with them. One should always meet the parents of the puppy and know the health history.